It feels really good to get another commission done. I just hope Brian likes it. This is an Illustration I did for a friend of the Studio that stopped by the booth at Dragon Con. 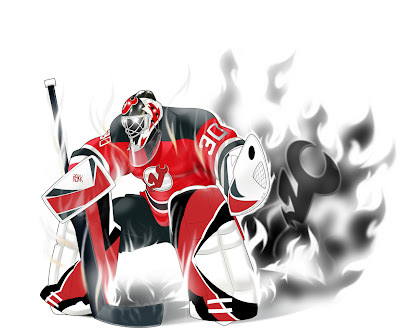 He wanted me to make up an art piece of his hero Martin Brodeur. Once I found out the guy played for the Jersey Devils, it was on. Honestly, I like the teams color scheme. If your a video game nerd like me you may catch the reference to Johnny Maximum. Dude...you knocked this one out of the park! Awesome...I love it! i too love it! as always you did it again! I'll have to show this to Jon. I wouldn't be surprised if he contacted you to do a Red Wings commission or art swap.